Changing my bands every day has become almost second nature and although talking is an interesting endeavor I am getting used to it. When I swap the bands out each day with new bands however my jaw joints are quick to register their complaint as they have not been stretched out over the course of the day! I talked a lot today and my jaws are definitely feeling it. What else are you supposed to do however, just stay quiet? I am sure most people just remember the location of their bands and even though I know where they are I am always worried that I am going to put the bands on the wrong hooks which will then cause further problems. 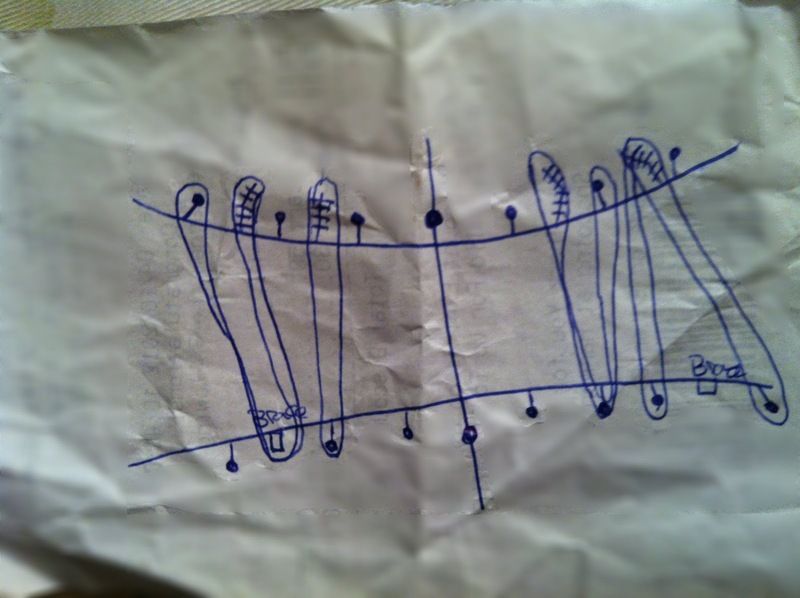 So I quickly sketched the location of the bands and keep it with the tool that they gave me to deal with the bands. As you can tell from the picture, a lot of my bruising seems to have disappeared whilst I slept! :) The Doc. tells me that I don't need to ice anymore but I continue to do as I think it helps my swelling, especially around my jaw joints. A few people have asked about my splint and specifically what is it? I can tell you right now that it is a nuisance and exceptionally inconvenient but very, very, crucial in terms of ensuring that my upper jaw stays the necessary width. As you know if you have been reading my blog, not only did my lower jaw get moved forward, but my upper jaw was also widened 12mm. The surgeon separated my upper jaw in the middle (pulled them apart as it were! ), added a bone graft to the now open void or gap to the tune of 12mm and then brought all three pieces back together. The problem of course is that the jaw muscles are used to a certain position, angle, stress load, etc., and so after surgery these muscles try to revert back to what they know as normal and without the splint that is exactly what would happen as the jaw and mouth muscles are presently stronger than my bones and bone graft. My reminder diagram of where my bands go! The splint essentially is a horseshoe-shaped plastic device that is wired to my top teeth. It was designed so that my teeth would fit perfectly in to it after surgery and it ensures that my top jaw will not move to its pre-surgery position until such a time that my bones are stronger than my jaw muscles. By this I mean that the bones will be able to resist any pressure that my jaw muscles exert in an effort to revert back to its former position. The surgeon refers to it as jaw memory, a concept I have never heard of before but he says that the jaw muscles basically need to learn their new position and how to chew, bite, etc., in their new position. Interesting. Geeky. Perhaps both. So there you have it, you now know as much as I do about the world of orthognathic splints! It is inconvenient because it protrudes considerably into the top of my mouth and inhibits eating, drinking, my tongue, and most importantly, talking! The splint hopefully will be off within a fortnight, here is hoping! One last note before I end and it is do with yawning. Let me tell you right now, yawning hurts! I don't even remember yawning the last week or so but I think I have yawned two or three times today and I am not sure I realised before today the exertion on your jaws and jaw muscles that it takes to produce a yawn! :) Ouch. SpaghettiOs. Something new. It worked. I drooled. Very attractive. Chicken noodle soup. All the ingredients were sliced and diced so that they were appropriately small enough to get in my mouth. Avoided the chicken for the most part as per Doc's orders. My surgeon told me if I was going to sneeze or cough then, (a) try not to :) and if that fails then (b) put my hand under my chin to hold it stable while I sneeze or cough. It is fair to say that it is not the most comfortable of feelings when either situation happens! Holding the lower jaw stable is the key basically . . .